JASPER, Ind. (AP) — A southern Indiana city councilman has been chosen to replace a mayor who's stepping down to take a senior staff post with Republican U.S. Sen.-elect Mike Braun. A caucus of Republican precinct committee members chose Dean Vonderheide from among four candidates Wednesday to finish out Jasper Mayor Terry Seitz's term. JASPER, Ind. (AP) — A southern Indiana mayor is stepping down to take a senior post with the office of Republican U.S. Sen.-elect Mike Braun. Voters casting midterm election ballots in Indiana are divided over the state of the nation, according to a wide-ranging survey of the American electorate. As voters cast ballots for U.S. Senate and members of Congress in Tuesday's elections, AP VoteCast found that 52 percent of Indiana voters said the country is on the right track, compared with 47 percent who said the country is headed in the wrong direction. INDIANAPOLIS (AP) — Mike Braun's Senate victory Tuesday helped solidify Republican control of offices across Indiana on what was shaping up as a strong night for Democrats elsewhere. INDIANAPOLIS (AP) — Republican Mike Braun, a multimillionaire businessman who campaigned as a political outsider, ousted Democratic Sen. Joe Donnelly on Tuesday after a race in which both tried to appeal to Donald Trump supporters. GARY, Ind. 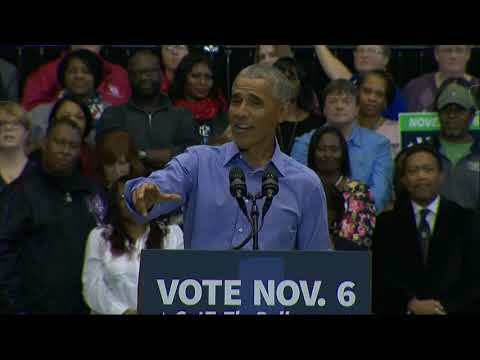 (AP) — Former President Barack Obama praised Indiana Democratic Sen. Joe Donnelly on Sunday for being willing to break with his party, telling a roaring crowd at a rally in the state that "you don't want just a yes man." WASHINGTON (AP) — No longer reluctant to speak out, former President Barack Obama delivered a closing argument for Democrats that seeks a firm check on President Donald Trump's policies in Tuesday's midterm elections. President Donald Trump is delivering a ringing endorsement of Republican Senate candidate Mike Braun, who is running in a close race against Democratic Sen. Joe Donnelly. Trump is praising Braun at a Friday night rally in Indianapolis as a successful businessman and patriot who will fight every day for the people of Indiana. 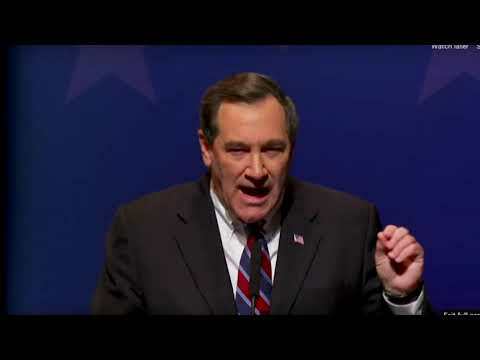 INDIANAPOLIS (AP) — Indiana Sen. Joe Donnelly regularly channels President Donald Trump in the closing stretch of the midterm election by bashing socialists, ridiculing the "radical left" and calling for a border wall with Mexico. INDIANAPOLIS (AP) — Democrats hoping to retake the U.S. House on Election Day probably won't get much help from Indiana voters, who will decide who holds the state's nine congressional seats for the next two years. The Associated Press fact checked the first Indiana U.S. Senate debate Monday evening among Democratic incumbent Joe Donnelly and his challengers Republican Mike Braun and Libertarian Lucy Brenton. Donnelly, a moderate Democrat who has been in Congress since 2006, is considered one of the country's most vulnerable incumbents in his race against Braun, a Republican who's modeled his campaign as a political outsider and businessman after President Donald Trump. INDIANAPOLIS (AP) — Democratic Indiana Sen. Joe Donnelly and Republican businessman Mike Braun don't agree on much. But both conceded one point Monday night, during their first debate: they support President Donald Trump. INDIANAPOLIS (AP) — Democratic U.S. Sen. Joe Donnelly from Indiana says Brett Kavanaugh won't get his vote for confirmation to the U.S. Supreme Court. Donnelly said Friday that sexual assault allegations against President Donald Trump's nominee are "disturbing and credible." Republican Mike Braun is running against Donnelly and called the decision to oppose Kavanaugh "a grave mistake." Braun said Friday that he continues to "strongly support" Kavanaugh's confirmation. INDIANAPOLIS (AP) — Vice President Mike Pence will be returning to Indiana next month to speak at a state Republican Party fundraising event. INDIANAPOLIS (AP) — Mike Braun, the Republican candidate for a crucial Senate seat in Indiana, often refers to his rival, Sen. Joe Donnelly, as "Sleepin' Joe" and has vowed to wake the vulnerable Democrat from his "siesta" on Election Day. INDIANAPOLIS (AP) — Democratic Indiana Sen. Joe Donnelly said Monday that a planned vote should be postponed on President Donald Trump's Supreme Court nominee, Judge Brett Kavanaugh, until Congress has time to review recent sexual misconduct allegations made against him. INDIANAPOLIS (AP) — The Indiana Debate Commission says all of the free tickets are taken for the first debate featuring Democratic Sen. Joe Donnelly and Republican former state Rep. Mike Braun. More than 400 tickets were made available for the Oct. 8 event, which will be held on the campus of Purdue University Northwest, in the northern Indiana city of Westville. The debate will be held at 7 p.m. EDT, or 6 p.m. local time in much of northwest Indiana. FORT WAYNE, Ind. (AP) — Indiana's U.S. senators have introduced legislation designating a large aircraft hangar in Fort Wayne as the site of a proposed National Airmail Museum. EVANSVILLE, Ind. (AP) — The White House Correspondents' Association says a volunteer member of President Donald Trump's advance team who blocked a photojournalist's camera as he tried to take a photo of a protester during a campaign rally in Indiana has been taken off the road. EVANSVILLE, Ind. (AP) — Casting the midterms as a referendum on his agenda, President Donald Trump urged Indiana voters to unseat Democratic Sen. Joe Donnelly, saying the vulnerable Democrat is "not going to vote for us on anything." EVANSVILLE, Ind. (AP) — Casting the midterms as a referendum on his agenda, President Donald Trump urged Indiana Republicans on Thursday to unseat Sen. Joe Donnelly, saying the vulnerable Democrat is "not going to vote for us on anything." A volunteer member of the advance team for President Donald Trump has blocked a photojournalist's camera as he tried to take a photo of a protester during a campaign rally in Indiana. EVANSVILLE, Ind. (AP) — City officials and businesses in southwestern Indiana are preparing for heavy security and restricted traffic ahead of President Donald Trump's campaign rally this week. INDIANAPOLIS (AP) — Indiana's largest business organization says it will not endorse any candidate for U.S. Senate this year in a blow to Republican candidate Mike Braun, the founder and CEO of an automotive parts business. EVANSVILLE, Ind. (AP) — President Donald Trump will hold a rally in Evansville next week. The rally at the Ford Center will begin at 7 p.m. on Aug. 30. Doors will open to the public at 4 p.m. Tickets can be requested online .